Colour fun run and ride! 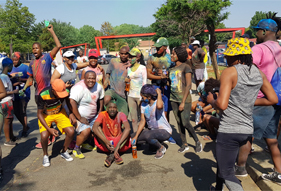 Residence Living and Learning Academy, together with the residents’ fitness academy, the VUT HIV and AIDS Unit (IHAU) and VUT FM hosted the second annual Vaal University of Technology (VUT) Colour Fun Run and Ride on 20 October 2018 as part of the Green Campus initiative. The aim of the event was to motivate students to adopt a healthy lifestyle. The event was hosted as the closing event of the very successful Health and Wellness Week which was hosted by IHAU. The aerobics team was on board during the week with the First Things First programme which afforded the students the opportunity to get various medical tests and checks done. “We then found it necessary to close the wellness week with our Colour Fun Run,” says Pakiso Tjotjo; Residence Life Officer. “Students ran the 5km race around Vanderbijlpark from Residence gate and back. “We requested people to bring bicycles for students who would prefer cycling to running. This made the event more incredible and most successful. Approximately 500 students participated this year and for next year we plan to collaborate with the Corporate Affairs Department to make the third one, the biggest VUT Colour Run yet!” he shared. “The event complied with the Emfuleni Municipal Policy as well as the VUT policy with all the relevant stakeholders, such as the SAPS, traffic department, VUT safety department and the VUT clinic approving and supporting the event,” he added. “We would like to extend our gratitude to the Residents Living and Learning Academy, the Dean of Students, Ms Busi Radebe, who sponsored the event with water, Powerades and colour powder, Red Bull, which sponsored refreshments, VUT Clinic which got paramedics and ER24 on board and Mr Mokgele Tsiu, a Safety Officer from the Safety Department, who was there to ensure compliance. Thanks also go to the Sharpeville cyclist club that invited the 3T club to come and encourage students to cycle as it is a great form of exercise and the GCI Green Campus Initiative for keeping the route and the space we used at Residences clean,” Mr Tjotjo concluded.